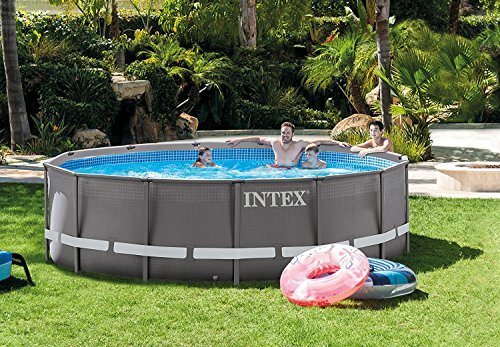 Intex Ultra Frame Pools have improved upon their history of top-of-the-line quality with new, innovative styling and a redesigned frame structure. New Hydro Aeration Technology has been incorporated into the cartridge filter pump to provide improved water circulation, filtration, & clarity as well as increased negative ions at the water surface. A 110-120 volt Cartridge Filter Pump with 1000 gallon per hour flow rate is included and is very easy to install - just hook up the hoses and enjoy clean refreshing water. Includes: Pool liner with SUPER-TOUGH laminated PVC sidewalls, 110 - 120 Volt Cartridge Filter Pump with 1000 gallon per hour flow rate, Ladder, Pool Ground Cloth, Pool Debris Cover & Set-up and maintenance DVD. Comes with a convenient drain plug that connects to a garden hose so the water can be drained away from pool or house area. Water capacity: (90%) 3,357 gallons. Intex Pools - The owner of this website is a participant in the Amazon Services LLC Associates Program, an affiliate advertising program designed to provide a means for sites to earn advertising fees by advertising and linking to Amazon properties including, but not limited to, amazon.com, endless.com, myhabit.com, smallparts.com, or amazonwireless.com.